I usually just throw all the ingredients into a bowl and mash them together when I make bean burgers, but this time I sauteed some onion and garlic, then whizzed them up with roasted red peppers, smoky vegan cheese, spices, tomato puree, a mixture of beans and some oats. I used my favourite jarred roast peppers in these burgers, but you could roast your own. the roast flavour does add to the flavour of the burgers. The cheese is a smoked vegan cheese and I used a mixture of haricot beans and black beans. 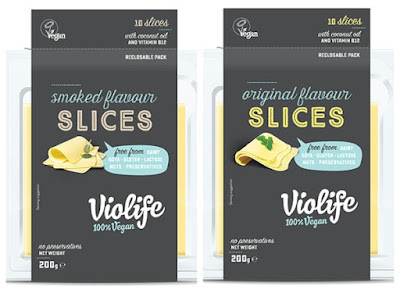 By now you will know that Violife is our preferred brand of vegan cheese. Graham spent the first couple of years as a vegan not eating cheese at all, as he thought vegan cheese was disgusting. Things changed when we discovered Violife and instantly loved it. It really made coming up with meal ideas easier. We go through gallons of their creamy original (cream cheese). Graham loves it on toasted cinnamon and raisin bagels, on toast, in sandwiches and in lunch wraps. I sometimes add it to sauces and in tarts too. Oh and we must not forget about my luxurious vegan cheesecakes I make with Violife cream cheese, whipped coconut cream and vanilla. Gorgeous. We use the original flavour block and slices for sandwiches and toasties, where it comes into it's own as it melts so well. We use their mozzarella on pizza and their Prosociano (a lot like Parmesan with that tang) on pasta. Violife are bringing out so many new cheeses that we can't keep up, but we haven't tried one we haven't liked yet. I used some of Violife smoked (the slices, I had them in the fridge, but you can also buy a block) in the burger mixture and the original cheddar style slices, which I topped the burgers with, grilled them to melt the cheese before stacking the burgers in buns. Violife cheeses are made with coconut oil and contain a vegan source of Vitamin B12, which can be hard to get enough of in a vegan diet. I stacked these cheese-topped burgers in toasted burger buns, starting with cos lettuce, slices of ripe red tomatoes and some free-from pesto. Simple but delicious. Feel free to stack the burgers with your favourite toppings. You could think about lots of salad; hummus and caramelised onion or cream cheese with salad and mustard. You decide! 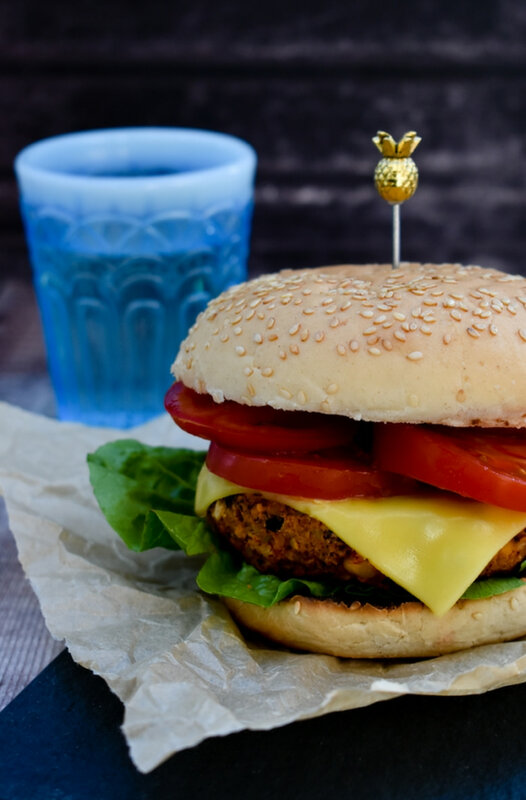 These burgers have 236 calories naked, so if you are counting calories or following the 5:2 diet you may want to serve these wrapped in lettuce leaves instead of a bun with slices of tomato and a drizzle of sweet chilli sauce. If you are not counting calories, then just stack them high and tuck in. 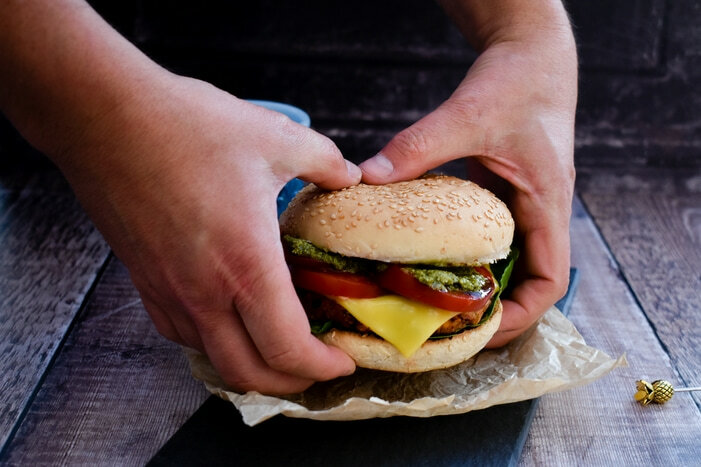 These burgers are a good source of protein, iron, potassium and calcium. Smoky red pepper, cheese and bean burgers. These juicy, smoky burgers are easy to make and great served stacked high in buns with salad and some vegan cheddar melted over them. Saute the onion and garlic in the olive oil until soft, then add the spices and let them cook gently for a minute or two. Add the onion mixture, beans, cheese, tomato puree and peppers to a food processor and whizz until the mixture starts to come together. Don't whizz it until it is completely smooth, you do want some texture left. Scrape the mixture into a bowl with the oats and season with salt and pepper. Mix well and then shape into six balls before pressing them gently into patties. The burgers can be cooked on a BBQ, grill pan or in the oven. I do find burgers are a little dry when cooked in the oven so I prefer the other methods. I grilled them on a grill pan with just a light spray of oil. Serve the burgers on toasted buns (inside), with your favourite toppings. Calories and nutrition are for each naked burger. 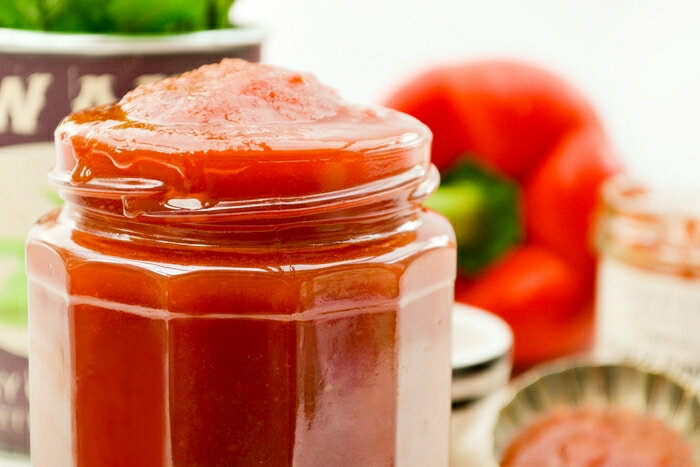 The perfect sauce for these burgers is my red pepper sweet chilli sauce. It's sweet, smoky and delicious! 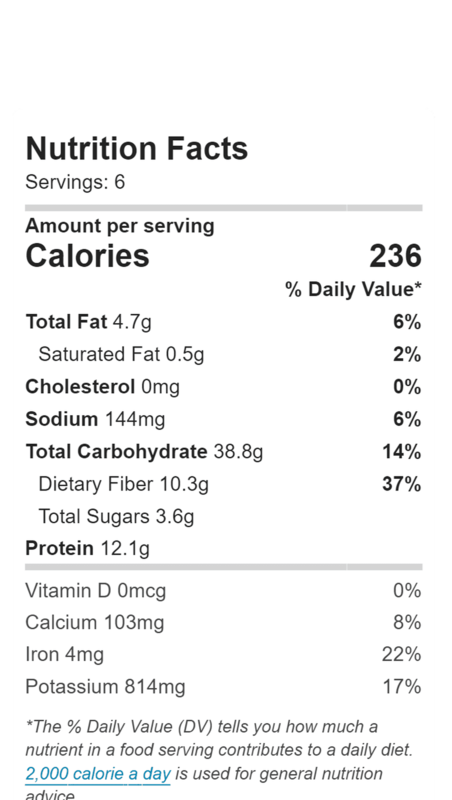 It's fat-free, very low in sodium and a good source of Vitamin A & C and only 28 calories per tablespoon. What more can you ask for? Oh yes it's delicious too. 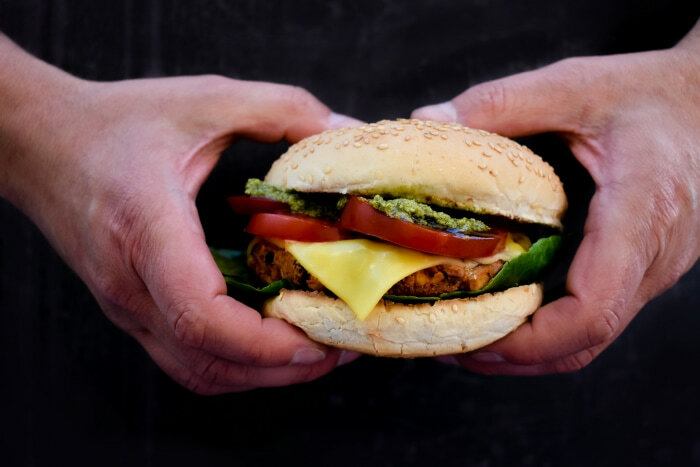 Disclosure: I created these burgers for Violife (I previously mentioned their products when I wasn't working with them but loved their products). I was not required to write a positive review and any opinions expressed are my own. What a delicious looking burger...yum! Thanks Waj, they were really good! This is so perfect for our vegan guests and I know I would love one (or two!) myself ! Haha yes they are rather moreish. You can use your favourite cheese, but you would find Violife is a little milder, but really nice. There are no weird ingredients either. They start with coconut oil. Yes a smoky flavour goes so well with burgers. Yum! This vegan burger looks delicious! I love all the smoky flavor you added. Red peppers are a favorite of mine. Yes I love red peppers too. I knew they would add a smoky flavour but also a sweetness as a contrast to the spices and the cheese. I'm not vegan but this sounds absolutely delicious! Tis is something I'll def need ot try. Oh do try them, they are really good. Don't think of them as vegan, just really tasty bean burgers. 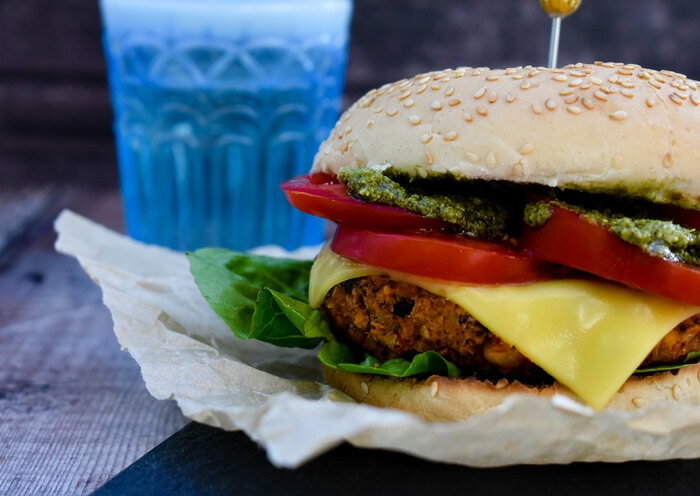 I'm always on the look out for another good veggie burger recipe and these sound great. Plus I love that you've included so many interesting ideas for toppings! Burgers are popular in my house so I do have to vary up the toppings. I hope you try these. Oh yummy! 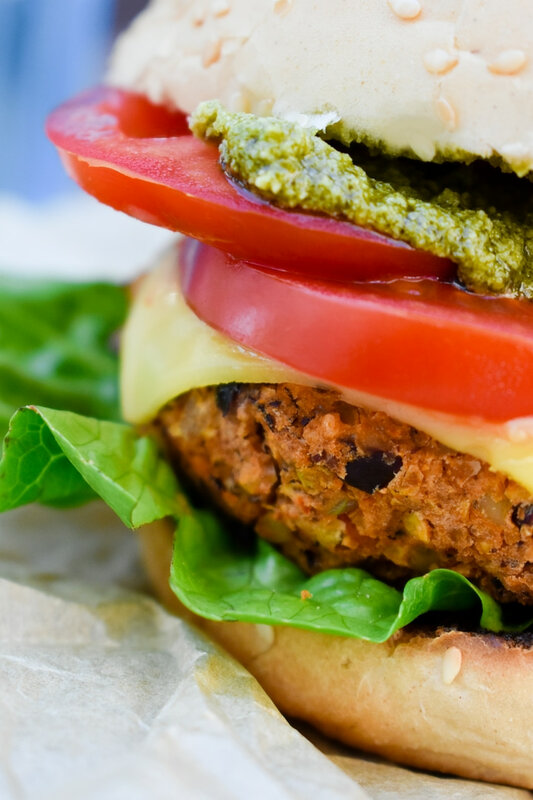 I'm always on the lookout for a delicious looking veggie burger and this is it! Pinning to try soon, thanks! You can't beat a good veggie burger Kristine. Enjoy! peppers of any kind are a favorite of mine and I don't eat meat so this sandwich is at the top of my list to make! Peppers are always a good ingredient. I hope you enjoy the burgers. These burgers look so incredibly delicious! I love a good burger - especially in the summer! These look fantastic. I wouldn't even miss the meat! Thanks Jenni and no you definitely wouldn't. What a beautiful sandwich and I think the roasted red bell peppers in there is so smart. What great flavors! Thanks Ginny and yes they add a lot of good flavour. I do love red peppers. Now that the weather is actually warming up here in PEI, Canada I can finally break out the BBQ! Thanks for the good looking burger recipe! Oh no that is not good. We love corn, but yes this is the burger for you then. Hope you enjoy it. Smokey is totally my thing. Add beans and cheese and I'm sold. I've yet to try a vegan cheese, so it's good to know where to get started. I'm not a fan of smoked cheese, but boy, those burgers of yours sound delicious. Well Violife is the place to start. You can use a cheddar instead of smoked cheese if you prefer Choclette. Yes you are right, it probably does add more flavour.